Below is the small seafood restaurant where I celebrated my 50th birthday with a former MI5 agent, who purchased this faraway pub to get away from it all. It was his birthday, too! With all of its ancient castles, churches, graveyards, and misty expanses, Scotland is beautiful and, at the same time, it can be spooky. I know this firsthand, having visited the country three times. My most mystical experience took place in the year 2000 as I spent four days studying at the Clan Donald Center library, and visiting my family’s castles. My most remarkable memory was of an evening in Ardvasar, a small community further out on the tip of Skye, past the Clan Donald complex. I was staying at the top of a hill that overlooked the Sound of Sleat, where the ferry “Lord of the Isles” crosses each day to bring its load of tourists and visitors to Skye. The bed and breakfast, where I was lodging, also happened to be the local post office, and the lady of the house was also the local ambulance driver. Ardvasar is obviously a small town in a far-away location. Just down the cobblestone road from my B&B stands the Ardvasar Hotel. It was here that I was to experience a time warp of sorts, on of all days, my 50th birthday, which I had always said I would spend on the Isle of Skye. For many years I had vowed to be on Skye on my 50th and my children made it possible by purchasing me a plane ticket for that week, to Scotland. With little sleep, I drove a few hours, from the Glasgow Airport, to an overnight stay in Crianlarich, about 6 miles above the head of Loch Lomond. The next morning the wind was howling and I was told about a gale blowing in from the Atlantic, and about a fishing trawler, missing off the coast of Skye, which it was feared had sunk with all hands. When I reached Skye, I checked into my B&B and headed for the Clan Donald Center, where I spent much of the next few days. At night I ate at the Ardvasar Hotel and when the big day came, my landlords asked if I was going to the birthday party that night, at the hotel. I was a little surprised as I hadn’t told anyone that it was my birthday. I was even more surprised to find out they weren’t talking about me, but rather about the owner of the pub, who was also celebrating that day. The innkeeper was a former MI5 agent and had settled down in this far off place to find some peace and quiet. My host came out to greet me and said he’d return to eat supper with me and buy me a few rounds of Guinness. While I waited for my food, I overheard about six to eight fisherman, bellied up to the bar, discuss the lost trawler. I specifically heard one of them say that the sailors out on the Orkneys considered themselves Vikings, not Scots. Each man was dressed in ancient fisherman’s garb of a pullover style of jacket, covering a woolen sweater, and most had navy blue sea caps on their heads. Their clothing, their accents, and their demeanor combined to send me back in time. The spell I was under was broken when one young man backed out of the crowd and pulled something shiny out of his pocket. Was it a gun . . . a knife? No. It was a cell phone! My little time travel came to an abrupt halt as he made a call on the modern contraption. It was as if a veil was parted between yesterday and today. Scotland has a wide collection of superstitions, including loch monsters, fairies, and the belief in curses. What is known, today, as Halloween is based on the old Celtic New Year of Samhuin. This celebration began on October 31st, with November 1st being the first day of the new year. At this time of year, spirits from the Otherworld were said to be closest to those on earth. It was also at this time that the gods of the Druids were to be appeased, and when “old souls” would meet again on Earth. During the celebration of Samhuin the veil between this world and the next was thought to be so thin that the dead could even return to warm themselves at the hearths of the living, and some of the living - especially poets - were able to enter the Otherworld. Samhuin not withstanding, there appear to have been some people in Scotland who were able to break through this mysterious veil at any time of the year, because they possessed what was known as “the second sight”. Those who had this gift seemed to be able to trick the barrier of time and dimension,often seeing into the future with considerable accuracy. Our family book has a very simple entry about Isabella McCuiston, she being the great, great granddaughter of my direct ancestor Robert, a 1735 Immigrant, which reads, “Had her second sight” – that simple, that nondescript, for such an odd ability. Normal vision is considered one sight, but the world of spirits was visible only to certain people, and the possession of this additional vision gave them the two sights. Through this gift they could see the ghosts of the dead revisiting the earth, and the doubles, or apparitions of the living. Many Gaelic words referring to spirits and ghosts begin with the syllable ta. The object seen is called taibhs, the person seeing it is called a taibhsear. Tannas refers to a specter, generally of the dead. Tamhasg is the double or spirit of a living person. Tachar was sometimes used to help describe places where visions took place. Perhaps the most famous of all Scottish possessors of second sight was known as the Brahan Seer -one Kenneth Odhar, born at Uig, on the Isle of Lewis, about 1650, just across the water from Ardvasar, where I sat 350 years later. Odhar became a laborer on the Brahan estates, the seat of the Seaforth chieftains, located in the shire of Ross, the earldom once led by Hugh of Sleat’s father, Alexander. Odhar’s predictions are legendary. While most people who were thought to have the gift of second sight seemed unaware of its source, a legend is told of how Kenneth gained his. As the story goes, his mother was startled, one night, to see spirits floating out of their graves at a Uig burial ground. She poked her staff into one of the graves to prevent it’s owner from returning. The dead woman, pleading to regain her resting place, offered Kenneth’s mother a small blue-black stone with a hole in the center, which would allow her son to look into the future. Regardless of the veracity of the legend, it is quite possible that Kenneth used such a stone for his scrying, or seeing into the future. Oracles have traditionally used some type of focal point tool such as a crystal ball or point of light, a tea leaf or even a bowl of water. It has been said that some Scots simply used the shoulder of a sheep for this purpose. Others stood under the archway of their door and focused on the distant horizon. The purpose for all of these tools was to take the person’s mind off themselves and allow them to wander into another time or dimension from where they received their visions. Another prediction explained that, “the time will come when full-rigged ships will be seen sailing eastwards and westwards by the back of Tomnahurich near Inverness," thus foretelling the Caledonia Canal, built many years after Kenneth’s death. Though Kenneth made several predictions, his final one led to his tortuous death, when he told the lady of the Seaforth manor that her husband was away with a mistress. Perhaps to save face, she had the poor prophet burned to death in a tar barrel. There are some who believe the Brahan Seer was a fictional character, meant to represent the stereotypical Highland seer, much like the character Bo Jangles, in America’s southland, represented African-American dance men of Vaudeville, or how “G.I. Joe” refers to the average American soldier. Others believe Kenneth to be the one and only Brahan Seer. 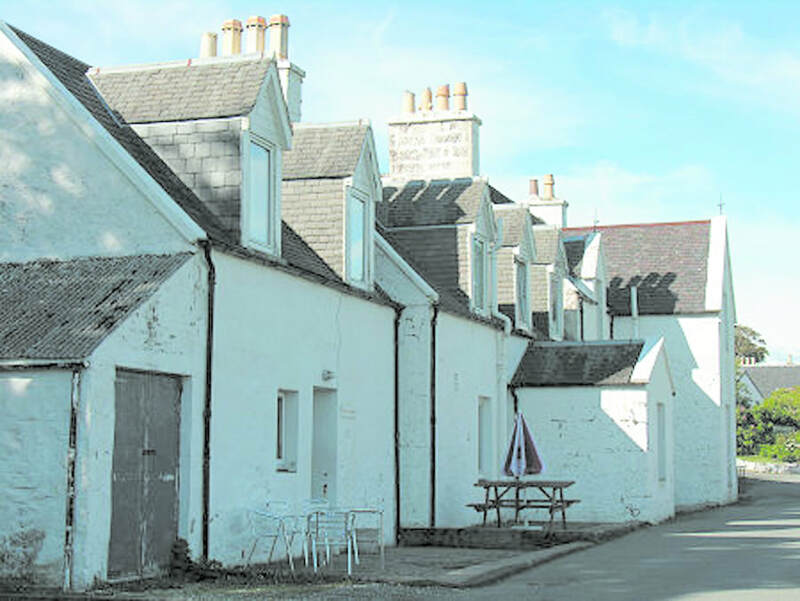 Kenneth was likely credited with many predictions that he may never have made, and it is said that he was long dead before the Seaforth’s even established themselves in Ross. However, the most convincing evidence that Kenneth did exist is a 16th century order, discovered by William Mackenzie, editor of Barbour’s Bruce, which was sent to Ross-shire authorities demandingthat they prosecute several “wizards” including one Coinneach Odhar. Coinneach is Gaelic for Kenneth. Though he may have been one of the more famous legends of second sight, the Brahan Seer was hardly alone. Other well-known seers included Rev. John Morrison, a minister near Inverness, and Rev. John Kennedy, a Dingwall “Free Church” minister. In his book The Days of the Fathers in Ross-shire (1861), Kennedy also claimed the gift for his own father, and for several other people he knew to possess second sight. It is interesting that many men of the church were believers or at least held an interest in this phenomenon. In 1763, Rev. John Fraser wrote Deuterosophia (Second Knowledge) or a brief Discourse concerning Second Sight. In 1696, John Aubrey also addressed the issue in Miscellanies. As late as 1902, John Campbell wrote, “The shepherds of the Hebrides Isles are usually credited with the largest possession of the gift, but the doctrine was well known over the whole Highlands, and as firmly believed in Ross-shire and the highlands of Perthshire as in the remotest Hebrides. That there was widespread belief in second sight, and much investigation into the subject, is well-documented. It has been, to some degree,mentioned in stories about Bruce and Wallace, and especially in connection with the ill-fated King James I. Common folk throughout the Highlands were said to possess this gift and several well-known explorers and writers on the Highlands and Islands of Scotland reported on this experience. Martin Martin, author of A Description of the Western Isles of Scotland (from 1703) recorded information on second sight, as did Dr. Samuel Johnson in his Journey to the Hebrides, published in 1775. In 1815, Scott released an edited version of Reverend Robert Kirk’s The Secret Commonwealth, first issued in 1691, which dealt extensively with second sight. 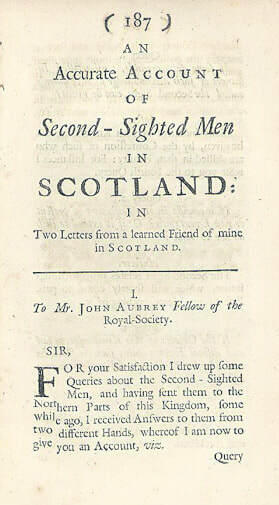 In Waverley, Scott seems to link second sight with Jacobitism. Martin, Johnson, Boswell, Scott, and Burns are five of the most famous and often-quoted recorders of early life in Scotland, and all were aware of the common belief in second sight. Others made their own investigations into this special gift. 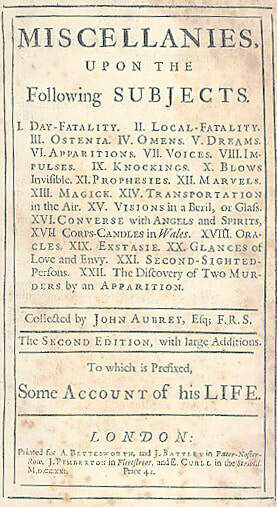 Robert Boyle, Henry More, Samuel Pepys, and Joseph Glanvil carried out so-called “scientific studies”. Glanvil was a self-styled skeptic and a member of the Royal Society, (the UK’s national academy of science) who became a believer, and to whom much credit is given as the initiator of psychical research. By the mid to late 1800s,Spiritualism, at least in part a spin-off of the second sight phenomenon, had taken the world by storm. The American Civil War is credited with causing thousands of people to attempt to contact their departed relatives, who had been killed in that terrible conflict, turning to mediums and psychics in the process. In the 1880s, the London-based Society for Psychical Research began occupying itself with the collection and examination of evidence on second sight. There were many well-known names among its members including one of its principal supporters, the Stewart (or Stuart) Marquess of Bute, a descendant of Robert the Bruce through his son, Robert II, who also held the titles Baron Cardiff, Viscount Mountjoy, and Earl of Windsor. Other members were Arthur Balfour, 1st Earl of Balfour, then a member of the House of Commons and later the Prime Minister of England, along with his sister, Eleanor. Gerald Balfour, second Earl of Balfour, was also a member as was the Earl of Crawford and Balcarres, Lord Rayleigh, and a dozen or so prominent men of science – doctors and professors, both British and foreign. Another very prominent member of the group was Britain’s then Prime Minister, William Gladstone, born in England of Scottish descent, whose boyhood home was known coincidentally, or not, as Seaforth House. The secretary/treasurer of the society was Duncan Mackintosh from the Bank of Scotland. Two brilliant authors, Mark Twain and Lewis Carroll, joined the group, too. These men are still two of the most often quoted writers in modern self-help books, and books on spirituality. It is obvious that the Society for Psychical Research was not a group of easily-fooled fanatics, but rather some of the more highly-placed,intelligent members of society. For several years the working members of this Society were occupied with collecting first hand well-attested experiences which appeared to be super-normal. As part of its larger investigation into psychic happenings, the societydecided to investigate second sight in the Highlands and Islands. In the late 1880s, Rev. Peter Dewar, of Rothesay, accepted the position of secretary, and sent out nearly two thousand questionnaires to ministers, schoolmasters, doctors, heads of police, land owners, and, as far as possible, to representatives of all classes in Gaelic-speaking districts of the Highlands. 1.Is “Second Sight” believed in by the people of your neighborhood? 2.Have you yourself seen or heard of any cases which appear to imply such a gift? If so, will you send me the facts? 3.Can you refer me to any one who has had personal experience, and who would be disposed to make a statement to me on the subject? 4.Do you know of any persons who feel an interest, and who would be disposed to help in this inquiry? At the end of six months, Lord Bute sent a second questionnaire in his own name, with somewhat better results, two hundred and ten being sent back, out of which sixty-four answers were more or less affirmative. The general conclusion from the study was that a significant number of people in the Highlands and Islands still believed in second sight. In a place where credence was given to loch monsters, fairies, and curses, this is not too surprising, although there may have been more to this particular belief. Events foretold, through second sight, might include the arrival of a ship or of the master of the house, a future scene of a terrible battle, or, most commonly, the death of a person. The latter was sometimes accompanied by a vision of a woman washing a death shroud for the soon-to-be-departed individual. One such premonition concerned the Chief of Clan Ranald, one Mac ‘ic Ailein nan Eilean, from the island of Benbecula. The chief’s henchman came upon a washer woman singing a death dirge, one evening, and insisted she tell him for whom she sang. The henchmen went immediately to the leader of Clan Ranald and relayed the story. The chief, perhaps in a panic, had a new coracle, or small boat,built and he was last seen paddling away from the area of Dun Borve, never to be witnessed by human eyes again. In spite of all the strange beliefs of the Scottish Highlands and Islands there has been much research carried out specifically in regard to the belief in second sight, and there have been many tales told around the rest of the world, since, to bolster the claim of psychic ability. Even today, television shows often feature related stories and many police departments regularly use psychics to help develop leads and solve crimes. I, personally, live less than an hour from the world’s largest spiritualist community and around these parts it is not uncommon to hear of “readings” and “mediums”, not just around Halloween, but anytime of the year. Lectures and classes on the subject are regularly advertised in local newspapers and magazines and the belief is common place here, just like back in spooky old Scotland. That there may be something legitimate to the phenomenon of second sight speaks well of the Scots of old for recognizing it so many years ago.